Removing a glued-on mirror is tricky but can be done with the help of a few friends and tools. Add a frame or get rid of this ugly mirror! Home buyers always groan when they find a builder-grade (can we say cheap!) 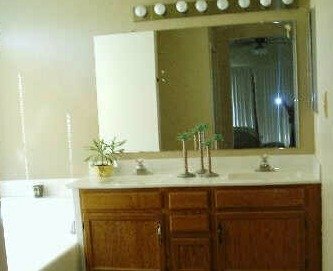 mirror in the bathroom when they are viewing a home. These large mirrors are a pain to remove, because they are usually glued to the walls for safety reasons. A mastic adhesive keeps the mirrors from rattling and eliminates the need for brackets. Removing them can be a bit tricky. Depending on the size of the mirror, you may need some help taking it down. 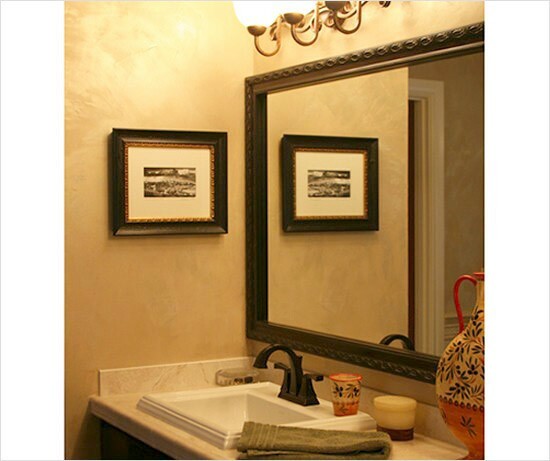 An alternative to removing a glued on mirror is to add a decorative frame around the edges with molding or wood trim. Freshen the look of your bathroom with this great home decor tip! Read on for information on how to do this. 1. Lay a tarp down under the mirror to catch any broken glass, that, hopefully, you won’t have. 2. Cover the surface of the mirror with cellophane and duct tape. If the mirror has any clips attached to the edges of the mirror, remove them. 3. Cut your wire or fishing line so that it measures 2 to 3 feet longer than the width of the mirror. Wrap each end of the wire around the dowels to create a crude saw. 4. Don your protective gear. 5. With the blow dryer set to the hottest setting, slowly go back and forth over the front of the mirror to soften the underlying glue. 6. To be safe, have your helper hang onto the mirror in case it comes loose. 7. Start working your putty knife under the edges of the mirror to loosen it. 8. If the mirror has not come loose by this time, take your wire, with one person at each end, and place it behind the mirror. Pull it back and forth just as you would with a saw. Have another helper standing in front of the mirror to catch it. If you're luck, your mirror will come off in one piece and you won’t have bits and pieces of glass shard to clean up! Watch the video demonstration below by DIY Network on removing a glued-on mirror from the wall with the use of suction cups. You can rent suction cups from any home improvement center. An great alternative to removing a glued-on mirror is to add molding or trim to the edges instead. This update to your bathroom decor will add value to your home. 1. 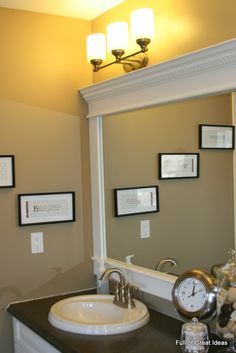 Measure each side of the mirror and have your chosen trim cut to fit at your local hardware store. 2. Clean all the dust and debris from the mirror’s surface. 3. Pour some rubbing alcohol into a rag and wipe the edges of the mirror where the trim will be glued. This will remove any grease that may prevent the wood trim from sticking. 4. Apply a thin line a adhesive on the back side and in the middle of the wood trim in a zigzag manner. Stay away from the edges to keep the glue from flowing onto the mirror. 5. Press the wood trim into place and hold until the adhesive is set. You could also tape the trim in place until the glue is dry. Repeat on each side. If you like the look of the decorative mirror in the photo on the right, you can order the frame (or choose from many other beautiful styles) from mirrormate.com. You simply select a style, measure your mirror and order-- it's so easy! The pre-cut frames are also easy to install; just press the frame right onto the glass while your mirror is on the wall. No tools or special skills needed! Pre-cut mirror frames will add instant appeal to your bathroom home decor, and keep buyers from thinking about all the work they'll have to do to take the mirror down..